On August 26, 2017, Hurricane Harvey made landfall in Texas as a Category 4 storm and Level 7 disaster, the highest American Red Cross disaster designation. It’s the most powerful hurricane to hit the United States in a decade. Initial reports estimate that several hundred thousand people have been temporarily displaced or affected by this storm. Google stands with those affected, and here are the ways we’re hoping to help through our products and our philanthropy. For people outside the affected area, the SOS Alert features the latest news, a crisis map, tweets, and the ability to make a donation for those affected. For people in affected areas, the SOS Alert features the latest news, a crisis map, tweets from local officials, and help and info content for transit and flooding conditions. The Harvey Crisis Map launched for this event, and featured within our SOS Alerts, includes the latest active alerts for the affected area, Waze-sourced shelters and road closure information, and weather information.Also, this map is embeddable for media outlets to freely use, with iframe functionality available through the share button on the map. 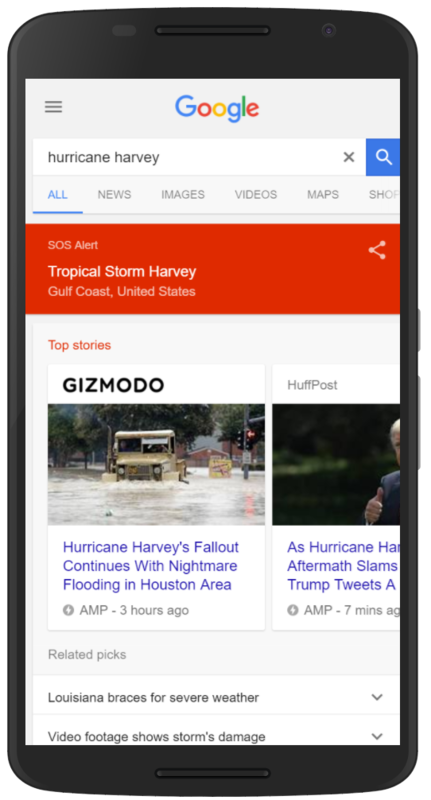 To support the organizations working directly with impacted communities, we’re making a $250,000 Google.org grant to the American Red Cross, and matching Googler donations up to $250,000 to the response efforts. Combined, the bulk of these funds will support the American Red Cross, who has been working to provide shelter and basic services for those affected, as well as Save the Children, Habitat for Humanity, and Team Rubicon. With more than 450 Googlers who call Texas home and thousands of other employees connected to Texas, the impact of Hurricane Harvey on our state is personal to many of us. We have been coordinating closely with the federal government, the Office of the Governor, and local elected officials to support their efforts on the ground. While the needs of the state will be great in the weeks and months to come, we hope that these funds will help provide the necessary resources to the communities affected and further inspire others to donate as well. We will continue to keep the people of Texas in our thoughts.